By S Lewis of Racing, Flying & Motor Clothing Fame Equipment, London. Size unknown. 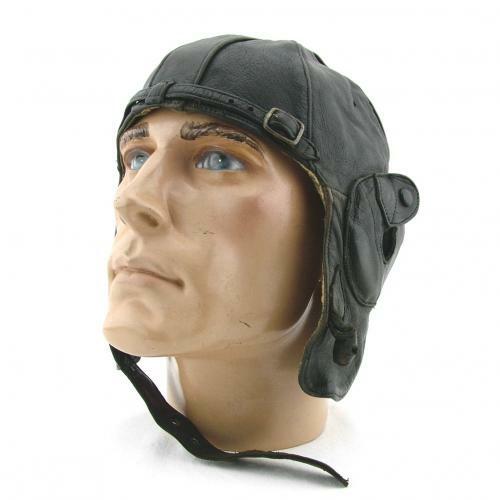 Typical 1930s private purchase helmet in dark brown/black leather with chamois lining. Adjustable buckled chinstrap and press studded leather earflaps for use with Gosport earpieces/tubes. The leather is generally in good supple condition although there is general minor wear. The chinstrap lacks some eyelets and the buckle is absent. The lining is quite grubby and has a small split at the neck (not visible externally). Nice embroidered label with owner's name. A reasonably good helmet. Stock code H21773.